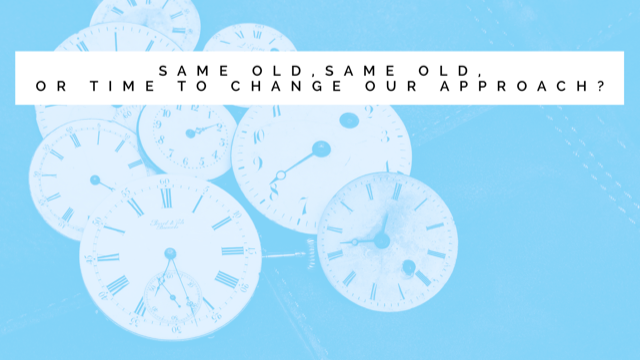 Same old, same old, or time to change our approach? David Mead, CEO of Future Proof asks whether we need to change our approach to protection. As an occasional contributor at and a regular attendee of industry conferences, I have on occasion begun to realise that I am getting an increasing sense of déjà vu. There is lots of well-meaning discussion about what ‘we’ as an industry can do to grow the market. How can we encourage or even persuade more people to buy protection products which will be there for them and their families in the event that they were unable to work due to ill health, were diagnosed with a critical illness, or God forbid if they were to die? The industry as a whole has tried many different approaches, including developing more comprehensive policies and covering more and more conditions. Definitions (the small print) have been improved so that the policy holder is more likely to be paid the benefit in the event of a serious incident, such as a heart attack. Developing faster and smarter online application journeys, making it easier for advisers to apply for cover. The welcome publishing of claims statistics has gone some way to re-assuring consumers that claims are paid. Training advisers so that they have the knowledge and confidence to discuss protection with their clients and last but not least the continuous downwards pressure on pricing. The fact of the matter is, none of these incentives or campaigns seem to be making an impact. Sales of protection policies have largely remained flat for several years. There are approximately 22,000 financial advisers in the UK. This means there is one adviser for approximately every 2,300 adults. Even if every adviser was discussing protection with every client, it is clear the majority of clients probably never get the opportunity to discuss their concerns and get the important advice that they need. To compound this chronic undersupply of advisers, it is clear that many don’t discuss protection with their clients. This is how we’ve ended up in a place where about 30% of people with a mortgage don’t have even basic life. Many advisers simply don’t have the time, as we know arranging a mortgage is a lengthy and complicated process. Wealth advisers often say their clients don’t have any protection needs, although this could be challenged by asking what would happen to the wealth if the client’s income stopped because of illness? Arranging protection is seen as time-consuming as it can involve lengthy medicals and even more protracted GP reports. Some advisers say they aren’t comfortable discussing potentially embarrassing medical issues with long-standing clients. A loading, or worse still, a declined application, could cause bad feeling with their client and create a reputational risk to their business. Product updates and changes can be hard to keep up with and advice provided often defaults to the lowest common denominator – price – rather than advising on added value products and services. As a result of these challenges, many firms are creating partnerships or collaborations and are now introducing their clients to proven Protection specialists. However entering into these relationships needs to be considered carefully and is often seen as a leap of faith. Thorough due-diligence should be carried out. Google searches will also provide a lot of helpful intel about your potential partner, just as TripAdvisor does for so many of us now before we book a holiday. What experience do they have of dealing with other introducers? Are they truly independent? Which insurers are they dealing with? What processes are in place to hand over referrals? What feedback can you expect? How do I know you won’t cross-sell other products to my clients? Do they have systems in place to allow commissions be shared on a non-indemnity as well as an indemnity basis? Non-indemnity income helps to build value in your business and mitigates risk. What does their client feedback look like? Would you be made welcome if you ask to visit? We all have a duty of care to our clients. None of us wants to be told that a client has fallen seriously ill, or has passed away and then to be asked by the client’s family what cover we advised them to set up when we arranged their mortgage or advised them on their pension or investments. There is a huge untapped potential income that collaboration with a specialist could help you bring on stream. There are millions of people who need protection advice. Imagine the impact if all 22,000 advisers truly engaged with protection and either arranged cover for their clients themselves, or referred them to a trusted partner? It could be a real game-changer!